Branksome Heights is a home for people who demand the finest environment for quality care in the Bournemouth and wider Dorset areas. Architects have come up with a design that combines simple elegance with modern comfort. Explore the services provided at Branksome Heights, which are designed to make every resident feel at home. Branksome Heights is a leading care home near Bournemouth delivering excellent person centred care. Looking for care homes in Bournemouth ? All 46 bedrooms have en-suite showers and toilets. Careful thought has gone into the décor to combine top class hotel comfort with a homely feel. Rooms have also been designed for the needs of people living with dementia. Our home has every facility to enhance your life, including generous sized bedrooms, spacious communal living areas, a landscaped garden and relaxed sun terrace. Activities are a big part of life at Branksome Heights and as well as a varied programme put on by our activities co-ordinator, residents will enjoy regular trips out. A diagnosis of dementia brings with it a very difficult and confusing time for the individual and their loved ones, and it is only natural to feel anxious about moving somewhere new. At Branksome Heights we ensure that the transition into our care is carefully assessed and managed in order to minimise upset to all concerned. Residents who are experiencing memory loss benefit from our enlightened approach to dementia care, which stimulates, supports and comforts in a safe and homely environment. 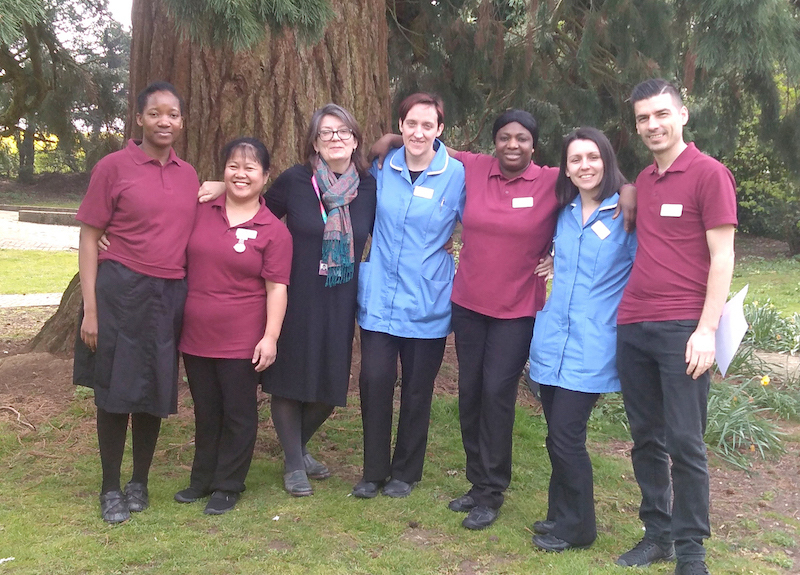 We are committed to providing the best possible outcomes for these residents, and we achieve this through our ‘Wings’ (Welcome, Individuality, Nurturing, Guidance, Sensitivity) philosophy of care. This award-winning approach is nationally recognized and our bespoke training programme is designed to ensure that the person with dementia is at the heart of everything we do. Whether it’s a friendly face, a warm smile or taking time to listen, making a positive difference to someone’s day is what makes our world go round. We place great importance on the lives our residents have led before coming to us. We spend time with them and family members to find out about their tastes, history, hobbies and interests. We see family and friends as our partners in caring for the individual and we welcome feedback and suggestions at all times. The information shared helps us to create individual care plans that are crucial in providing the best care and help us get to know the individual. Residents are helped to achieve their aims by taking part in meetings, surveys and one-to-one sessions. Branksome Heights is in a sought after area of Bournemouth with good access to the town centre, seafront and Bournemouth Upper Gardens. As well as designing a home for people who demand both comfort and style, we have given just as much thought to landscaping and residents will love our garden and sun terrace. Come Dine With Us – Branksome Heights are tackling loneliness in the local community, by opening their doors and welcoming you in for lunc..
31st - Come Dine With Us – Branksome Heights are tackling loneliness in the local community, by opening their doors and welcoming yo..
Seaside Day – Branksome Heights recreate a day at the beach, with sand, a BBQ and traditional seaside treats!.. 21st - World Alzheimer’s Day..
Open Day with Macmillan Coffee Morning – We start the day with a coffee morning and bake sale for Macmillan. A chance to view the home and..
International Day of Older People ..
Christmas Come Dine With Us - Branksome Heights are tackling loneliness in the local community, by opening their doors and welcoming you in ..
We realize that the move to a care setting can be a challenging time for those moving and their relatives. Please feel free to contact the home for any information or advice, and if we cannot help you we will try and point you in the right direction.